This is a Northern Pike correct? I found this photo on the interweb, I believe it was caught in Europe. I don't know, just seeing what you guys think. I don't think they do tiger muskies in Europe...though I could be mistaken. 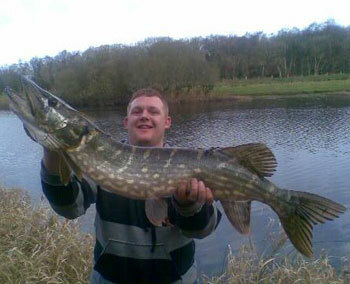 The only pike species in Europe are the Northern and Amur pike, and that one isn't an Amur. http://www.thenextbite.com/node/15671 There is the link. The main problem with this thread is the fact your link takes us to a forum where someone gathered photos by unknown people from various reported locations which we are unable to verify or communicate with the actual author/photographer. in the future, I would prefer we communicate with the actual photographer/author. http://www.shannon-f...ke08/jan9th.htm This is another site with it on it. I think it's the original site. Hope it helps!! Pretty sure Ireland, the UK and the rest of Europe only have Northern Pike. Edited by Gambusia, 14 June 2010 - 07:53 PM. Yeah, I guess the Amur pike only occurs in Asia...my mistake. Is it me, or does that picture look photoshopped? Look at the guy's left hand, the orientation of the fingers is wrong. It ould be, but I doubt it, even if it is. What is he holding?